The Bermuda Triangle, also called the Devil's Triangle, is an imaginary area that can be roughly outlined on a map by connecting Miami, Florida; San Juan, Puerto Rico; and the Bahamas, an island chain off the coast of the United States. Within that triangular area of the Atlantic Ocean have occurred a number of unexplained disappearances of boats and planes. Additionally, readings on directional devices do not operate normally inside the triangle. Unusual events in that area date back in recorded history to 1493 and the first voyage of Christopher Columbus (1451–1506) to the New World. In his log, Columbus noted that his compass readings were askew within the area now called the Bermuda Triangle, and he and his crew were confused by shallow areas of sea with no land nearby. The term "Bermuda Triangle" was first used in an article written by Vincent H. Gaddis for Argosy magazine in 1964. Gaddis claimed that several ships and planes had disappeared without explanation in that area. The article was expanded and included in his book, Invisible Horizons: True Mysteries of the Sea (1965), where he described nine mysterious incidents and provided extensive detail. Many newspapers carried a story in December of 1967 about strange incidents in the Bermuda Triangle after a National Geographic Society news release brought attention to Gaddis's book. The triangle was featured in a cover story in Argosy in 1968, in a book called Limbo of the Lost (1969) by John Wallace Spencer, and in a documentary film, The Devil's Triangle, in 1971. 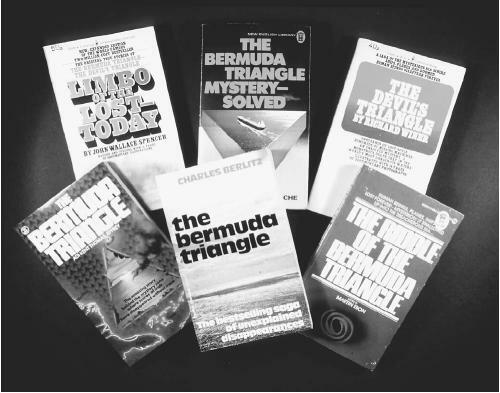 Charles Berlitz's 1974 bestseller The Bermuda Triangle marked the height of the disaster area legend, but some of its sensationalized claims were quickly proved inaccurate. As early as 1952, George X. Sands had noted in a report in Fate magazine that an unusually large number of strange accidents had occurred in the region associated with the Bermuda Triangle. That many of the accidents in the area are intriguing, and that the area does have some natural conditions that sailors and pilots need to be aware of, has not been challenged. However, neither statistics nor documented evidence indicates that the number of accidents is unusually high or without explanation. In March 1918, during World War I, the USS Cyclops vanished in the Bermuda Triangle. That ship may have been a casualty of war, but the December 1945 disappearance of Flight 19, a training squadron of five U.S. Navy torpedo bombers, became the most notorious of disappearances associated with the Bermuda Triangle. The squadron left Fort Lauderdale, Florida, with 14 crewmen and disappeared after radioing in several distress messages. A seaplane sent in search of the squadron also vanished. Those two airplane disappearances were frequently cited as the Bermuda Triangle legend grew during the 1960s and 1970s. Few of those stories included telling details. All of the crewmen of Flight 19 were in training, for example, except for their patrol leader, who had tried to withdraw from his flight duty that day because he was feeling ill. After his compass malfunctioned soon into the flight, the flight leader decided to navigate by land-marks below on the islands of the Florida Keys, with which he was familiar. Visibility became a problem because of a sudden storm, and the leader became disoriented. Flight 19 was still in radio contact with the Fort Lauderdale air base, but after some mechanical difficulties they failed to switch to an emergency frequency. Radio recordings indicate that some of the crew believed they were heading out over the Atlantic Ocean, instead of the Gulf of Mexico as their leader reported. A search plane took off and was claimed to have disappeared into the Bermuda Triangle with Flight 19. The plane actually blew up 23 seconds after takeoff. Wreckage from Flight 19 has never been recovered. Other aircraft that have disappeared in the area include a DC-3 carrying 27 passengers in 1948 and a C-124 Globemaster with 53 passengers in 1951. Among the ships often listed among the mysteriously disappeared are the Mary Celeste (1872), the Marine tankership Sulphur Queen with 39 men aboard (1963), and the nuclear-powered submarine Scorpion with a crew of 99 (1968). The Mary Celeste entered the list of supposed Bermuda Triangle mysteries many decades after its odd tragedy. The ship set sail from New York to Genoa, Italy, but was found sailing unmanned some 400 miles off course, off the coast of Africa. Personal articles of the crew were found and food storage areas showed no sign of upheaval. A tattered sail and a missing lifeboat suggested the boat had encountered a storm, but the ship's log, in which information was recorded as late as nine days before the ship was found, made no mention of any kind of catastrophe. There is no evidence, however, that the Mary Celeste ever entered the area of the Bermuda Triangle. Still, the eerie, unanswered questions concerning its fate are often cited by those who attribute a malevolent force as being responsible for odd and tragic events of the triangle. Nevertheless, there are many documented disappearances that occurred within the triangle. They include a four-engine Tudor IV air-plane lost in 1948, with 31 aboard; an American freighter, the SS Sandra (1952), which sunk without a trace; a British York transport plane, disappeared in 1952, with 33 aboard; a U.S. Navy Lockheed Constellation airplane, vanished in 1954 with 42 aboard; a U.S. Navy seaplane, 1956, with a crew of 10; a French freighter in 1970; and a German freighter, Anita, lost in 1972 with a crew of 32. Theories about why so many air and water ships disappeared in the Bermuda Triangle involve strange magnetic fields, time warps, the lost continent of Atlantis, and alien abduction. Other proposed explanations include physical forces unknown to science, a "hole in the sky," and an unusual chemical component in the region's seawater. Several books have suggested that an intelligent, technologically advanced race living in space or under the sea has been responsible for jamming equipment and leading ships and planes to disaster. Many books and articles play up mystery angles concerning vanished ships by depicting the disappearances as having occurred in calm weather and daylight. Such particulars of Flight 19 as an inexperienced crew, a faulty compass, a squadron leader who failed to follow instructions, and conditions of deteriorating weather and visibility are often not mentioned. Larry Kusche, a librarian at Arizona State University, examined claims of mysterious disappearances and recorded evidence from each example. The results, published in The Bermuda Triangle—Mystery Solved, showed that many of the accidents happened during raging storms, or were later explained. The area known as the Bermuda Triangle is one of the two places on Earth where a magnetic compass does point towards true north, a phenomenon called compass variation. Navigators must compensate the amount of variation or the craft they are on will go off course. A region commonly called the "Devil's Sea" in the Pacific Ocean is the other area of compass variation. The Gulf Stream that runs through the Bermuda Triangle area is swift and turbulent, and can quickly erase evidence of a disaster. The unpredictable Caribbean-Atlantic weather can suddenly change into thunderstorms or create waterspouts. Many short and intense storms build up quickly and dissipate quickly, undetected by satellite surveillance. The ocean floor has shoals around islands as well as some of the deepest marine trenches in the world. The interaction of the strong currents over reefs promotes a constant flux and the development of new, uncharted navigational hazards. These factors can confuse even experienced sailors. A large number of pleasure boats travel the waters between Florida's coast and the Bahamas. The U.S. Coast Guard receives more than 8,000 distress calls per year, averaging more than 20 per day from that area, often from sailors who have run out of gas. natural conditions. Scientific evaluations of the Bermuda Triangle have concluded that the number of disappearances in the region is not abnormal and that most of the disappearances have logical explanations. Paranormal associations with the Bermuda Triangle persist, however, in the popular imagination. Berlitz, Charles. The Bermuda Triangle. New York: Doubleday and Co., 1974. Spencer, John Wallace. Limbo of the Lost. New York: Bantam Books, 1973. Kusche, Lawrence D. The Bermuda Triangle Mysteryâ€” Solved. New York: Harper and Row, 1975. 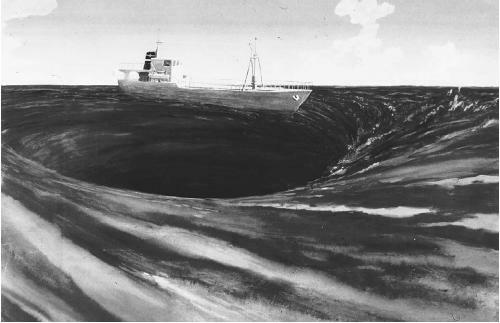 The article includes the details about the people how hav undergone voyage across the bermuda triangle.It just includes a single statement about the reason of such disasters.it would be good enough if the phenomenon would have been explained in an elaborative way.the magnetic force effect does explain about it a bit but is not sufficient for the complete information.the site should atleast have some links to the sites providing the complete information about the phenomenon in detail. can you tell me where is the bermuda triangle originated?????? I want to know why the mystery of the bermuda triangle is still unknown, the cause of the triangle and whether there are existing beings in the triangle. is it possible to solve its mystery by navigating in it or over it using analog devices???????? is there any comment made by any pilot or sailor after entering that region and before disappearing, if yes, then what evidence do we get from them??? where can we find all the relavent information about this !!! it is irony that,today with such high advanced tech still we couldn't unfold this mystery. can you tell me where is the bermuda triangle originated????? ?is it possible to solve its mystery by navigating in it or over it using analog devices???????? How we will know the true reason ?can't we use our technology to know this? Is there have any power among the creature of good those are doing this? is there have any men who face this tragedy and alive? what are the reaction of them? Is that picture ,with the boat and the water "hole"; a photography? Or is it only an imaginary picture? drawing or something...? So they have never found not even one ship or plane from the triangle at all? Not even the worlds most hi-tech ships can track the reckage of the ships or planes? If so, why not? See Vivek It Is The Bermuda Triangle that several ships and planes had disappeared without explanation in that area. The Bermuda Triangle will always be mysteriously interesting for me or any other person. This topic is really interesting and I think it's really worthed for me to read about it probably because no one knows the mystery that lies behind it's occurence. It's really scary too, for me I think. its nice but more details should be provided here with more pictures of the evidence so that it will help the reader to understand it. obviously a ship nor a plane can make it thru the bermuda triangle, so my question is could a submarine make it thru there? That would be interesting to find out. The picture of the ship going down into the whirlpool, that looks very fake. I think that it's quite natural, in the area of explanation for some of the disappearances has focused on the presence of vast fields of methane hydrates on the continental shelves. Laboratory experiments carried out in Australia have proven that bubbles can, indeed, sink a scale model ship by decreasing the density of the water, any wreckage consequently rising to the surface would be rapidly dispersed by the Gulf Stream. It has been hypothesized that periodic methane eruptions (sometimes called "mud volcanoes") may produce regions of frothy water that are no longer capable of providing adequate buoyancy for ships. If this were the case, such an area forming around a ship could cause it to sink very rapidly and without warning. i want more and more information about bermuda triangle. please send me in my email id. i usually think that what this mystery is. the first thing what i opined when i heared about this when i was a child was that it might be a magical mystery and disappearence of any thing going into the triangle made me think so. infact this is the mystery which nobody is able to define and make any exact reason behind such happening. yes, i would like to know about it as i have keen interest in this fact. well what would i say, a fact or mystery.after reading this article my scope of interest in this topic has increased more. I think this subject is releted to either aliens or atlanta Culture. I have no exprince about barmuda... But! because of the gravity the things pull down. why was the wave circles are formed. i think this is alian place. or here gravity is less. OR A WEIRD POWER ASSOCIATED WITH IT. Today, I was discussing about weather in different parts of earth with my collegue. We were discussing on each Island and moving towards America. Suddenly he said here is the Bermuda trangle, mysterious place, where so many unexplained accidents happens and claimed many lives. I was surprised because I haven't heard this before. I google it and got nice explanation. But now i am wondering either the picture,the water hole and ship going to be disappeared, is true or just an imagination? I don't believe on GOD and so on. I am really wondering about the scientific fact. i just want know about the Bermuda Triangle it is use ful for me, the only question from me is with all these modern technologies why its not been expolred so far. I have studied abut this triangle during my school days as mysterious events has happened even in todays hightech world, we have to believe that some superior/supernatural power may be surviving there. A Vascodagama mentioned in his book that he heared some strange and astonishing noise which were not usually made by human beings. It seems to be like ghostly screaming. I have herd lots about THE BERMUDA TRIANGLE but you don't know what believe i wonder what is taken all those flights ,planes,boats and people down do the bottom of the ocean some people say that it is something that is sucking things down but most people want to find out what is going on so why is it not been explored so far? I was in the airport and i was going to florid and the flight to florid got dilated i wondered why i asked this women she said that the Triangle has got the plane it is in the ocean the womens face was like she had saw a ghost you might need to go on to another plane i asked what is the Triangle she said am not sure all i know is that loads of planes and boats have went missing and are never seen aging i asked do people go and explore it she said no people are scared to go down and see what is there .That whole night i was in the airport i thought really hard and kept thinking about the people that are under the water and i kept think what if i was one that plane i would not be here. I say its still unpossible to solve this mystery because it has been around for centurrys, and if atlantis DOES exsist, it could be that the atlantin people figured out SOMEHOW to live under water. and if they truely exist, then that means that we would be able to figure out on how to live under water? what are some of the theory's that could be true about this problem? why havent they find out what's the problem if this has been around for century's? Need more factual stories about the Triangle. More up to date information. The article lack cogent reasons and scientific justification. Instead of prudent explanation only mystries have been discussed which lead to further confusion. I am astonished as to why the scientists of todays world are so helpless to solve this mysry for ever and releive th ecommon man from this terrific thoughts. they can send un-maerial vehicles and drones to find out the actual facts. Are today's scientists not capable of solving this issue? why don't they try to find facts and what is so difficult about it? satellites may be focussed with powerful cameras for photoing the area and let the world know the facts rather than fiction about the Barmuda Triangle. I beleive that the people do not die, I beleive they dissapear into the "Triangle" and it is a loophole to travels in time. I t is a very interesting thing. I wonder if the mystery will ever be scientifically understood. The Bermuda Triangle, I think, would forever remain a mystery. God only knows what strange things are goin' on on the other side of this planet. I wonder, can they just send a vessel onto the Triangle (without human aboard) with thousands of cameras connected to somewhere in Florida or the Bahamas? I mean, can just these ocean engineers built a very very long device onto the vessel and see whether the vessel will be swallowed into a hole in the sea. Its hard for me to believes in these things ,about the UFOs that they exist and that real those plane where missing unless other people the hited that planes with a heavy explosion that hit and left no evidents. i have heard and read many things abt bermuda tringle bt i dont know wat to believe cus ol de things i've heard are legends or just an opinons.and also am curios at this time with ol this high tech why havent we humans figured it out yet? I was wondering if their is a book that has a list of people on board the U.S. Lockheed Constealltion Airplane in October of 1954...Thank you!!! i propose the presence of a black hole which engulfs and swallows everything within its ergo sphere. BARMUDA TRIANGLE IS DUE TO POLES CONCENTRATION OR NOT . IF NOT WHAT IS THE REASON FOR FORMATION OF BARMUDA TRIANGLE. Is there wifi/internet in the barmuda triangle? If there is,sent someone there with a camera so you can experience the bermuda triangle?! ?